It is with great pride that the agency Roadmaster Booking announces the European tour of one of the greatest representatives of the Chilean underground Death Metal scene, the UNAUSSPRECHLICHEN KULTEN. 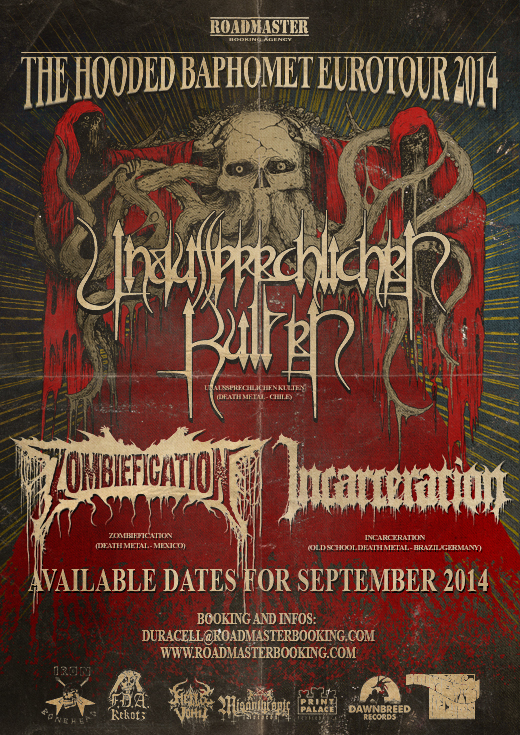 The tour will be in September 2014 and will also feature ZOMBIEFICATION (Mexico) and INCARCERATION (Brazil / Germany). U. Kulten is a band that belongs to the deep South American underground scene and is unknown to most of the bangers in the world. This tour gives us the opportunity to spread our plague over the “First World”, we hope to poison many souls! Roadmaster Booking trusted us, now it’s our turn to respond decisively and professionally. We felt very comfortable to share this tour with Incarceration and Zombiefication, both bands are like us and belong to the same undeground circuit: Metal without compromise, just passion and devotion for death! Bangers can expect a tireless and energetic show, each ritual performance for Europe will be held in a deep trance and spiritual exacerbation, we will invoke the “Old Ones” with the most rotten and dissonant Death Metal that our capabilities allow us, everything will be blasphemy, aggression and devotion.